Research: Pecans Click on Pecans to read full article. ARS scientists in Weslaco, Texas, are developing new methods to increase yields and organically manage pecan trees. 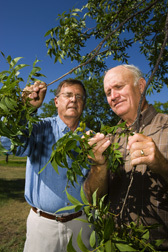 Here, soil scientist Joe Bradford (left) and Danny Phillips, a retired Hamilton County, Texas, Extension agent, inspect pecans from the 2008 crop in the organic study orchard, which is expected to greatly outyield the conventional orchard.